Preheat the oven to 375F. If your squash is quite large, start by slicing off the stem. This makes it easier to slice through and also gives you a flat base to work with. You can do this on a cutting board or an old tea towel. Place squash flat end down. With a [recently sharpened] chef’s knife, slice down the middle length-wise. With a metal ice cream scoop or spoon, scoop out the seeds & guts. Brush halves with a tiny amount of olive oil. Sprinkle with sea salt and freshly ground black pepper. Place on a baking sheet lined with parchment paper, cut side down. The salt & pepper you just sprinkled on will stick to the oil. Roast at 375F for around 35-45 minutes, or until you can easily scrape strands away from the squash. The outer yellow skin will also deepen in color. Baking time will vary depending on the size. 5-pound squash takes 40 minutes. Remove from oven and flip each half. At this point, feel free to use the fork to see if the strands easily come off. If it’s ready, cool for about 5-10 minutes and then grab the fork and scrape the squash flesh over and over. You’ll be left with a bunch of spaghetti-like strands! Mix with marinara sauce and enjoy! 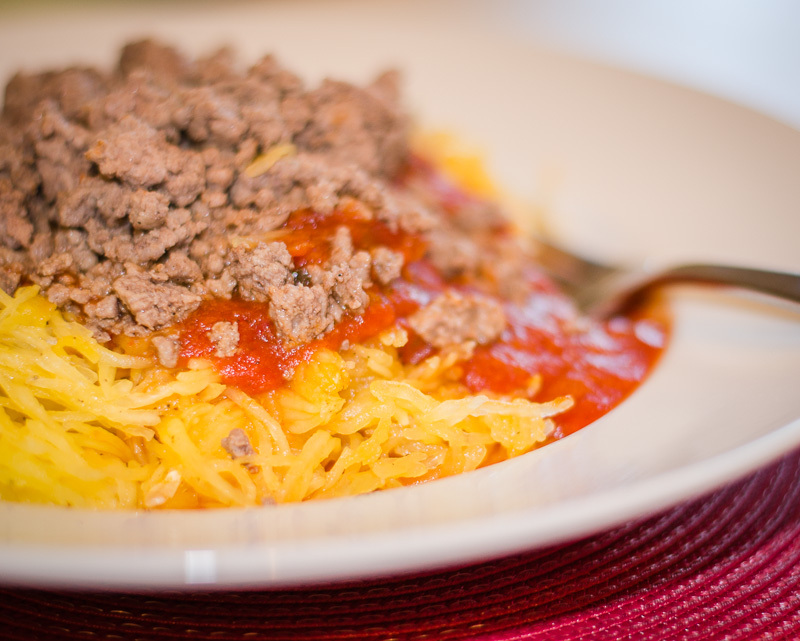 This entry was posted in Healthy Kitchen, Recipes and tagged austin, gluten free, healthy recipe, ignite, ignite your life, spaghetti squash on October 28, 2014 by iGnite Your Life.